Shanghai’s only curved major road ramp, a big tourist attraction which provides a close-up view of the Bund and its opposite skyscrapers in Pudong, will disappear in three months, a project official said yesterday. The ramp, which has been at the eastern end of the Yan'an Elevated Road for just over 10 years, is hailed as the "No.1 Curve in Asia" by many locals because of its prime location with a view that highlights both sides of the city. Before month's end, it will start to be pulled down to give way for a huge vehicle tunnel below the Bund to ease traffic congestion. A lower version of the ramp will eventually link the elevated road and the tunnel, or "Bund Passage". The tunnel is scheduled for completion by March of 2010. "Related elevated traffic will be controlled during the construction period," Qin Kangde, an official of the Bund Passage Project, said yesterday. He said preparation work for the demolishment of the ramp has already started and major construction will kick off within this month. So far, the exit of the elevated road near the Bund towards the Nanpu Bridge has been closed. By the end of this month, the curved ramp will be closed completely, Qin said. During construction, part of the Yan'an Elevated Road near the Bund area will be banned for traffic for two years, while the entrances and exits near the Xizang Road and the Fujian Road remain operational. Traffic around the Bund area will be more congested during construction but the end result will make the wait worthwhile, officials said. Running for 3.3 kilometers, the tunnel will become a key underground artery between the Hongkou and the central Huangpu districts. In addition to the highway ramp, the Wusong Road Floodgate Bridge will also be dismantled and the century-old Waibaidu Bridge will be relocated for a year to make way for the all-important tunnel. 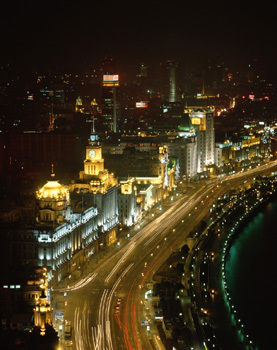 The previous major reconstruction of the infrastructure around the Bund area was conducted in 1992. In recent years, Shanghai has been involved in extensive infrastructure development. Due to inconsistencies in urban planning, the government has had to eliminate or rebuild some existing facilities. For example, two years ago the government began a reconstruction program near the crossroads of Zhongshan Road N1 and Zhenping Road in Putuo District. The aim is to rebuild the pillars of a section of the Inner Ring Road to allow a tunnel for the Metro Line 7. This project is ongoing and its completion date is not clear.